Ray is an outcast, who makes his way to town every Tuesday to pick up necessities. It is on one of these trips that he sees a poster from the local animal shelter, advertising a scruffy-looking, one-eyed mutt for adoption. He immediately adopts the dog, who he names one-eye. Ray never went to public school, instead staying at home, reading whatever books he came across. He never knew his mother and his father was often absent. One-eye is not Lassie, but a real dog that attacks other dogs and finds nasty things to roll in. In a way, he becomes Ray's canine therapist, as Ray slowly reveals his tortured past and years of loneliness. This is not a feel-good book, and there is an underlying sense of dread, as if something dark and ominous is just around the corner. The last few pages of Spill Simmer Falter Wither still haunt me a week after I closed the book. A powerful debut. It is springtime, and two outcasts—a man ignored, even shunned by his village, and the one-eyed dog he takes into his quiet, tightly shuttered life—find each other, by accident or fate, and forge an unlikely connection. As their friendship grows, their small, seaside town falsely perceives menace where there is only mishap—and the duo must take to the road. 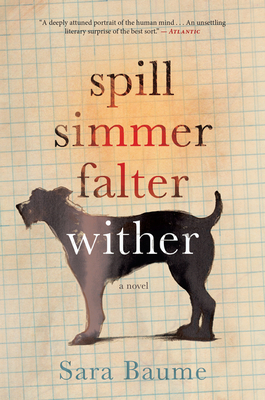 Gorgeously written in poetic and mesmerizing prose, Spill Simmer Falter Wither is one of those rare stories that utterly and completely imagines its way into a life most of us would never see. It transforms us in our understanding not only of the world, but also of ourselves. "[Baume] has a way with words...As you sink into the rhythms of Baume's prose, you can almost smell the salt air and feel the sting of a small town that can be unforgiving to those who are different. "—NPR, "Best Books of 2016"
"A man-and-his-dog story like no other. "—San Francisco Chronicle, "Recommendations from Book Passage"
"Sara Baume’s exquisite debut has a simple plot: an outcast man and his dog One Eye take to the road in a ramshackle car and watch the world, weather and seasons change as they drive through the highways and byways of Ireland. But the prose is full of wonder, inventive, poetic and dazzling, concerned with the smallest detail of the natural landscape and the terrain of human emotion, as Baume heartbreakingly describes how an ordinary life can falter and stall. "—Sunday Express UK, "The best books about memories, misfits and mysteries"
"A mesmerising debut. "—Telegraph, Featured at #8 in the "Autumn Arts Preview"
"Every so often a book comes along that is so perfect it takes your breath away, and leaves your heart hammering with the beauty of the writing and the sadness of the story. Sara Baume’s debut, Spill Simmer Falter Wither, is such a book…Baume’s prose is full of wonder – inventive, poetic and dazzling, concerned with the smallest details of the natural landscape and the terrains of human emotion. Absolutely astounding. "—Psychologies, "Book of the Month"
"A touching tale about a misfit man finding a misfit dog provides lots of opportunity for exploring what it is to be lonely and outcast, what friendship means, the nature of family. "—Western Morning News (UK), "Best books to curl up with"